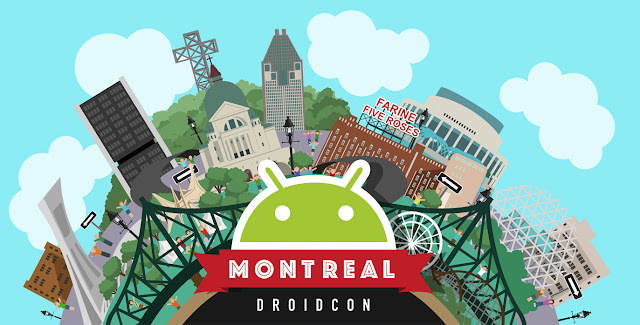 It's unfortunate, but the Droidcon planned for Montreal has had to be postponed. The website uses the term cancelled, but I think it's just going to have to pick a new date, and a new date has issues with locations, etc... so it'll take some time to do that. What happened was that Droidcon Montreal was scheduled for May 19/20 this year, and then Google I/O came along and picked the same dates. It'd be very hard for the community in Montreal to compete against the large pull that Google I/O would have. I'll be keeping my ear to the ground to see when it is rescheduled, and hopefully I can be there! Since then, we have looked at our options for new dates, which then led to the obligation to look for a new venue and new suppliers. We are sorry to announce the cancellation of droidcon Montreal 2016. If you already purchased your ticket, don’t worry! During the week of January 25th, we will fully reimburse every ticket holder. If you really really want to attend a droidcon conference this year, you can look for droidcon San Francisco or for the next event near you at http://droidcon.com.